If your family Thanksgivings are anything like mine there will be plenty of Thanksgiving leftovers taking up room in the fridge. 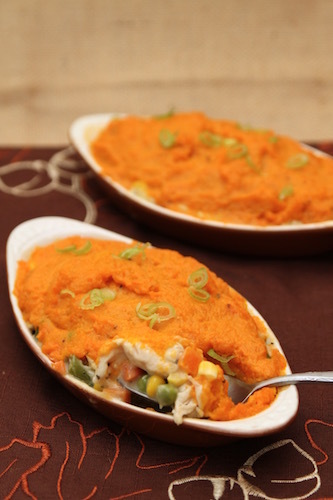 This leftover turkey casserole topped with sweet potatoes is a fun spin on a classic Shepherd’s Pie recipe with new ingredients! 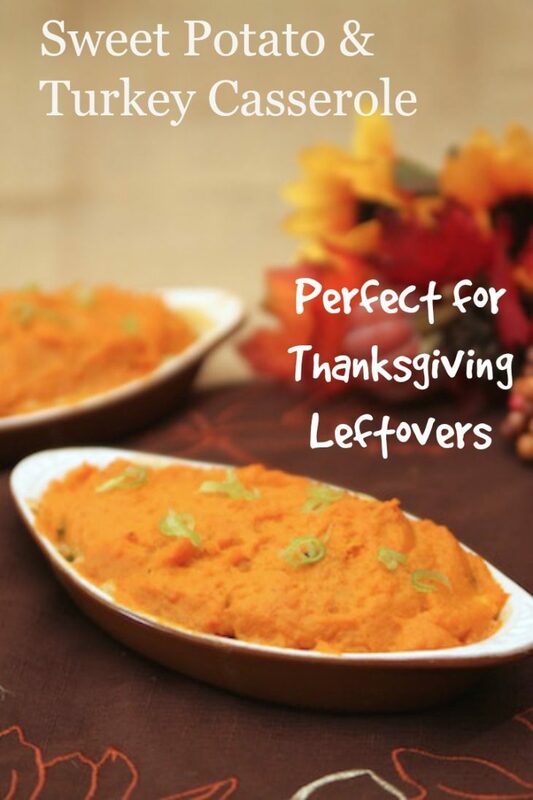 This is a great recipe for Thanksgiving leftovers because of the fact that everything, except the mixed veggies, is pre-cooked so it’s just a matter of putting things together in a casserole dish and warming it up. It is easy enough for anyone to throw together for you, and is super yummy. I made the casserole in two small, individual dishes. I love searching out great dishes at thrift stores and antique shops. I found these dishes at a local thrift store for less than a dollar which I thought was a heck of a find. Sadly, they only had two dishes left. I would have loved to find at least four of these so I could make up meals in advance for my parents. If you have older parents that live alone you could make these after your Thanksgiving dinner and send them home with them. They simply need to reheat and enjoy the next day or two. I used a bag of frozen mixed vegetables in the casserole along with turkey and gravy. 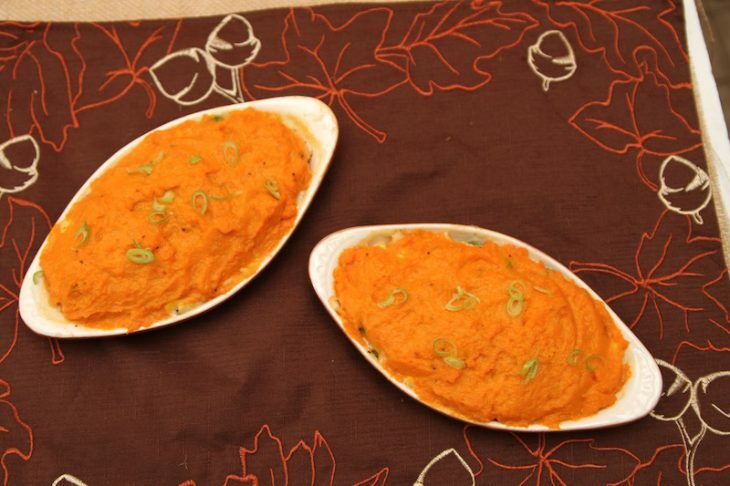 I topped the mixture with mashed sweet potatoes and baked until heated through. This leftover turkey casserole is one of those super easy things to make that can easily be adjusted to what you prefer and what you have on hand. If you have left over green bean casserole you could use that instead of the frozen mixed vegetables and gravy. 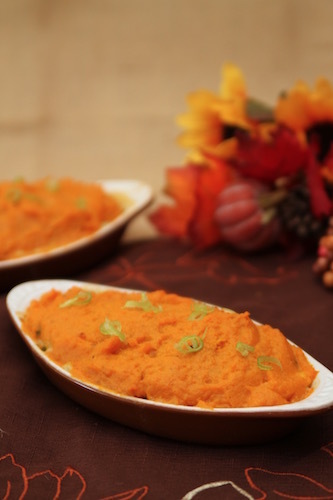 Simply mix together chopped turkey and green bean casserole and then top with the mashed sweet potatoes. I like to put it under the broiler for a few minutes at the end to give the top just a bit of a crust, but you can simply bake until heated through if you prefer. 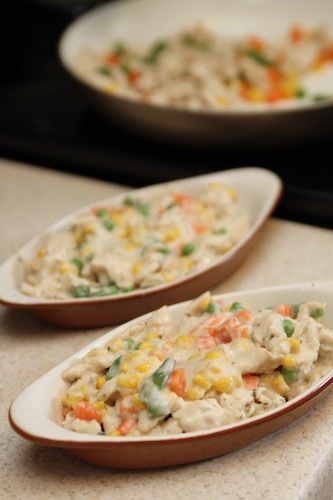 In a medium sized bowl, using a large spoon, mix together the turkey, gravy, and vegetables. Divide the mixture in half and spoon into individual casserole dishes. Top each dish with sweet potatoes. Make this super easy leftover turkey casserole topped with sweet potatoes for your family as an after Thanksgiving meal everyone will enjoy, and you’ll love making since it is almost completely cooked already!